A dynamic centre with the ability to unlock defences with his quick feet, D'Arcy has cemented a place within the Ireland squad in recent years although injury has plagued his pursuit for international honours. Capped for Ireland at Schools, Under-19 and 'A' level, the hard-running youngster was fast-tracked into the senior squad and made his debut as a replacement in a pool game against Romania at the 1999 Rugby World Cup. A dip form saw him lose his place at Leinster and he returned to play for the Irish Under-21s. 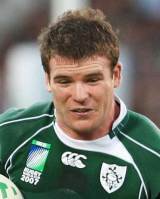 Back in full fitness, a number of eye-catching displays for his province saw D'Arcy gain an international recall for the start of the 2004 Six Nations, ironically coming into the Ireland starting line-up for his injured provincial colleague Brian O'Driscoll. Making up for lost time, D'Arcy was superb during the tournament with his first two Test tries helping Ireland to a Triple Crown-clinching win over Scotland. Despite an injury plagued 2004-05 season, D'Arcy was named in the British and Irish Lions squad for their 2005 tour to New Zealand but only appeared in the warm-up clash against Argentina. Free from injury and in a rich vein of form, he would go on to play in all 19 of Ireland's Test matches between November 2005 and March of 2007, prior to the summer tour to Argentina. Most recently he was been sidelined for 10 months with a multi-fractured arm suffered against Italy during the 2008 Six Nations and after several set backs he returned to provincial action at the end of the year with hopes of staking a claim for further honours in 2009. D'Arcy received a call-up to the British & Irish Lions squad the same year and played in three of the tour matches but did not feature in the Tests. D'Arcy went on to feature in every game of the 2010 Six Nations and scored a try against New Zealand on Ireland's summer tour, before his campaign was cut short through injury. He enjoyed a fantastic 2010-11 season which culminated in one of the most epic finals in recent history. D'Arcy was a key figure in Leinster's 33-22 win over Northampton Saints. D'Arcy featured prominantly in the 2011 Six Nations squad, starting all five Tests, and was included in ireland's 43-man provisional World Cup squad in June 2011. The Leinster centre retained his place in the Ireland midfield for the World Cup and the subsequent Six Nations tournament, despite displaying average form.